‘Tis the season to be jolly. While you’re doing last-minute shopping, attending office parties, and drinking egg nog, take time out to think of the people of northeastern Japan – especially the children – who have lost so much as a result of the March 11 earthquake/tsunami/nuclear crisis. Why not add another Christmas card to your list? It takes only a few minutes, and you’re sure to bring cheer to a child in Japan who has had a difficult year. Takuo Tanaka, professor emeritus at Chuo University in the suburbs of western Tokyo, Japan, began the campaign Xmas Cards from Friends Around the World to brighten the holiday season for thousands of children in Tohoku. 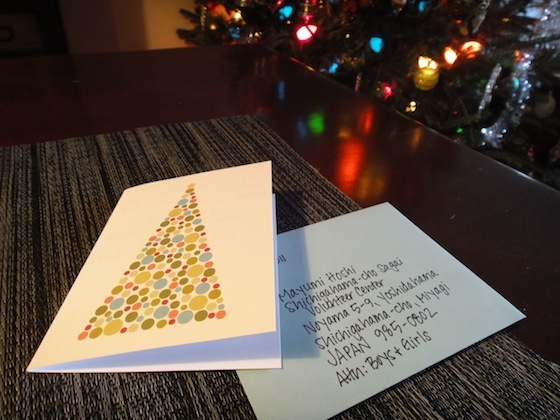 After visiting the area and talking with principals of junior high and elementary schools, Professor Tanaka devised the Christmas card campaign to warm the hearts of children in the area. The initial purpose of the campaign was to distribute the Christmas cards to children attending a piano concert on December 16. That date has passed, of course, but according to the group’s Facebook page, everyone is welcome to continue sending cards. Next Next post: Happy Holidays from JapanCulture•NYC!